Even when the Presidio was an active military post, the Main Post had still been considered the main hub, and it continues to be the center of the visitor experience to this day. Stop by the Officers Club and Visitor Center to begin your journey through the Presidio. Here guests will find restaurants and cafes, art installations by Andy Goldsworthy, archaeology sites, cultural attractions such as the Bowling Center, Digital Art Center, Social Club, Community YMCA, Sport and Medicine Center, the Main Parade Ground, Yoga Studio and more. There is also a large outdoor gathering field for picnics, festivals, and informal outdoor activities. The Presidio was a founded military post for the purpose of defending the gate. Walk around the Golden Gate Bridge along the western shoreline to observe remnants of these wartime days such as the cannon and coastal gun batteries at the Fort Point Historic Site. 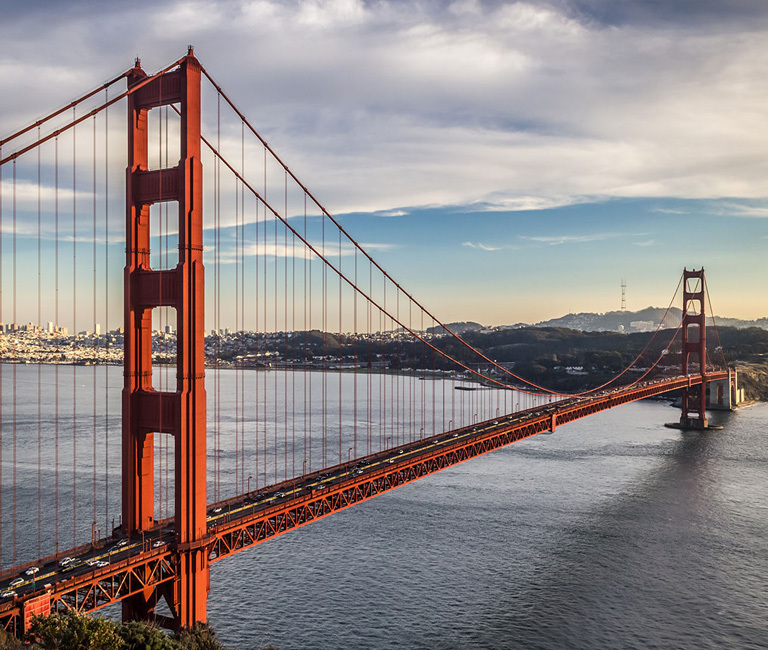 Enjoy breathtaking views of the Golden Gate Bridge and skyline views of the city from the bridge itself, Baker Beach and the Golden Gate Overlook Point. Walking and cycling trails are available on and around the Golden Gate Bridge for all to enjoy. Hiking trails, rare natural habitats, forest areas, campgrounds, birdwatching and golf courses expand through the southern Presidio from Mountain Lake to Tennessee Hollow Watershed. Both adventure and recreation are available in the Southern Wilds. In this quadrant, visitors will find more art installations, Arion Press, several scenic overlook points, El Polin Spring hiking area and Julius Kahn Playground and Field. In the northern shoreline, panoramic views, picnic areas, open beaches and recreational fields await. Crissy Field quadrant first served as home for the Native Ohlone and then was taken on as an Army airfield and military-industrial center. Now led by the National Park Service and Golden Gate Parks Conservatory, millions of tourists and locals alike enjoy all that this 100-acre area has to offer. Walking and biking trails extend along the coast with gorgeous views of the city, and Golden Gate Bridge and two large picnic areas are available at East Beach and West Bluff on either end Crissy Field. Nature lovers can enjoy bird-watching at the Crissy Marsh. Former airplane hangars now serve as a rock climbing gym and trampoline house, and an overabundance of history is served at the Military Intelligence Service Historic Learning Center. Small cafes and quick-serve restaurants are scattered throughout the area as well.